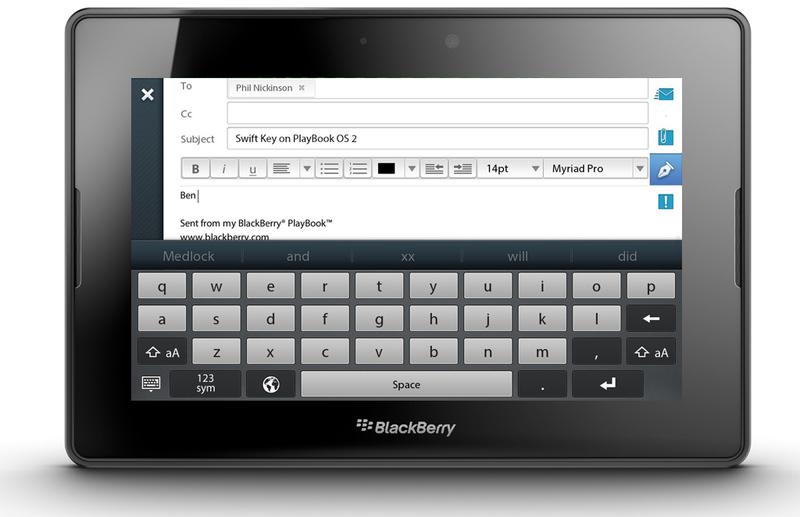 Uncovered: BlackBerry PlayBook OS 2.0 Uses SwiftKey Keyboard! Well, that didn't take long to figure out. One of the enhancements within BlackBerry PlayBook OS 2.0 is an updated keyboard, which includes some nice new features over the original PlayBook OS keyboard. I love how the keyboard now inserts the number row above the letters when filling out fields and also love the addition of text prediction, which was lacking. Absolutely loving PlayBook OS 2.0 this morning, I called up Phil Nickinson, our Editor in Chief on our sister site AndroidCentral, for a little video chat to show off to him some of the OS 2.0 hotness. As soon as Phil saw me typing on the keyboard he said, "type in Phil... do you get Collins?" Sure enough, after typing in Phil and hitting the space bar, "Collins" was autosuggested. I showed Phil a few other things, and then he stopped me after I typed another name. Ben. The first word suggested was the name "Medlock." Phil got excited. Or mad. Can't really tell which. "Congrats... that's SwiftKey." It turns out Ben Medlock is the CTO of SwiftKey, a third-party Android keyboard, and that's a little pre-programmed autosuggestion they put into their autosuggestion. Along with Swype, SwiftKey is one of the big and awesome third-party software keyboard technologies/developers out there. And while we haven't seen any official acknowledgement from either BlackBerry or SwiftKey on this one yet, without a doubt we can say PlayBook OS 2.0, and it looks like BlackBerry 10 will be rocking SwiftKey technology on the keyboard front in some form, either officially or behind the scenes.